You may be surprised to learn that nutrition is a bit of a controversial subject nowadays. There are a plethora of homemade diets (both cooked and raw) and various dog foods out there; however, most advocates will tell you that their diet is the best. The reality is that unless you know what you’re doing and have a diet analyzed, homemade and raw diets can be risky due to potential deficiencies and bacteria. They can be costly and somewhat inconvenient to prepare as well. If you choose to do the homemade or raw diets, be sure to discuss them with your veterinarian and perhaps a veterinary nutritionist to determine if you’re meeting all the nutritional requirements your dog’s needs. If you’re not interested in raw or homemade diets, there are plenty of good puppy foods available. In most cases, skip the grocery store and bargain brands because they tend to be chock-full of sugar, salt, artificial colors, flavors, and fillers that do nothing nutritionally. Although grocery stores occasionally carry premium brands, the best place to look for puppy food is a pet supply store or even a feed store. Look for a premium dog food formulated according to AAFCO(American Association of feed Control Officials) guidelines as complete and balanced for growing puppies or for all life stages. - The puppy food must be complete and balanced and have some statement of meeting or exceeding AAFCO guidelines for formulation or in feeding trials. It must be formulated either for all life stages or for growth. - The puppy food should be a premium brand. “Premium” is only a marketing term; nevertheless, you need to look for a food that is highly digestible. - You should be able to buy the puppy food at more than one retailer near you. - Your puppy likes the food. Look at the dog food’s label for feeding guidelines. Most dog food have some sort of feeding guidelines for size and age of your. If doesn’t, ask your veterinarian what would be an appropriate amount for your puppy. If you own a dog then you are probably aware of certain foods that you should not feed. However, pet obesity is on the rise and many people still choose to feed their pets inappropriate foods or treats. Whilst some foods do simply encourage selective feeding and obesity there are others which are potentially dangerous to dogs. Here is a list of some of the foods you should NEVER offer to your dog. As in humans, alcohol can cause intoxification but with dogs it can quickly lead to death or coma. Products such as chocolate, coffee, tea and many carbonated drinks contain caffeine. They also contain theobromine or theophylline. These three substances can be toxic to dogs and if fed can lead to a heart attack. Avoid feeding your dog high levels of fat, including fat trimmings from human food. It leads to weight gain and associated problems brought on by obesity. It can also lead to pancreatitis. It has been reported that an unknown toxin in both grapes and raisins can lead to kidney damage. Liver is fine if fed sparingly, however, in excess it can lead to vitamin A toxicity. These nuts contain toxins and it is believed that consumption of these nuts can cause problems with the dog’s digestive system, nervous system and muscles. Milk is not necessary for adult dogs. Some adult dogs cannot cope with the amounts of the enzyme lactase, found in milk. You may find that feeling milk will lead to diarrhea. Mouldy food may contain harmful toxins that can lead to an upset stomach. If it is mouldy throw it away! Mushrooms contain a collection of toxins that are harmful to dogs. In the worst case, mushroom consumption can lead to shock and even death. Onions and garlic should not be fed t a dog, whether they are raw, cooked or powdered. They contain sulfoxides and disulfides which if fed repeatedly can cause anaemia. Potato, potato stems, tomato, tomato stems, rhubarb. These foods can affect the digestive system and cause urinary infections. Raw eggs can decrease the absorption or vitamin B into the blood stream. Reduced levels of vitamin B leads to skin problems and a dull coat. As with humans, salmonella is a risk with raw eggs. As with raw egg, raw fish can lead to a vitamin B deficiency. If raw fish is fed regularly it can lead to seizures and death. Salt is not necessary in a dog’s diet. If fed excessively salt can lead to electrolyte imbalances. As with humans, excessive sugar can lead to weight gain, tooth decay and diabetes. 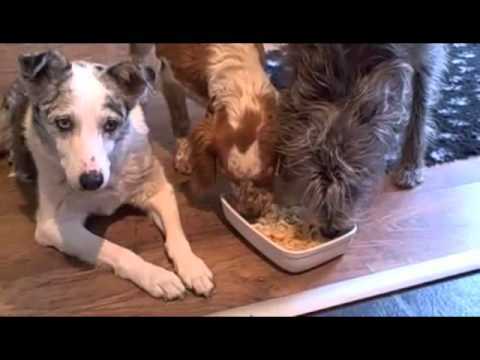 Try to avoid the habit of feeding your dog your leftovers. It can cause habitual begging, weight gain and selective feeding. Offer your dog his own food, at his own meal time, in his own dish. Whilst this guide aims to be informative the list of foods is not exhaustive. If you are in doubt about what to feed your dog please consult your vet. Dog Aggression Towards People – Inborn or Acquired? Dog aggression towards people is obviously the most undesirable of all dog traits. The sight of a dog hurting people is hard to imagine. Dog aggression should therefore be stopped before your pet can inflict harm on people – including yourself. Aggression is actually the result of trauma, stress, anxiety or a combination of any of these. Dogs instinctively take strange things as threatening, so a dogs needs to be flexible and be made quick to adapt to new things and new situations. Genetics plays a big factor in the dog’s capability to be flexible and to easily blend to new things. But a dog’s ability to quickly adapt to new things is not all there is that makes up a well-behaved pet. One factor that could lead the dog to become aggressive its being lack of exposure to people. In order for dogs to get used to the presence of people, as early as 14 weeks, it should be given a chance to experience the real world where people other animals and different sounds flourish. Exposing a puppy to different scenarios that depict the realities of the world will help the dog see these things as ordinary, preventing them from getting anxious. Dog abuse, as everyone knows, has almost everything to do with a dog’s misshapen behavior, including aggression towards people. An abused dog becomes nervous and distrustful and punishing it for its behavior can only make it nervous and withdrawn. Dog aggression to humans could be caused by an underlying problem that needs the intervention of a professional behaviorist. This behavior needs to be arrested at the earliest possible time in order to prevent your dog getting into trouble which will surely involve you. One particular method that professionals use in treating dog aggression is called desensitization. This process needs you to point out all the possible factors that contribute to your dog’s aggressiveness. Once these factors are clearly defined, the specialist pairs each one of these with positive reinforcements so that the dog will begin to identify the rewards with the trigger events. It takes a while before your pet learns its new habit, but with constant practice and consistency, transformation can always happen. In order to facilitate a gradual transition of your dog’s behavior, do not expose it to situations that had been known to trigger its aggressiveness; such as bringing it in the presence of children if it is uncomfortable or uneasy with kids. This has to be done gradually and keen observation is needed to be sure that your pet has adopted itself to the situation. Actually, there is no guaranteed science that can remove dog aggression towards people. But what experts do is formulate effective ways to prevent dogs from developing the behavior. 4. If it’s okay on your part, neuter or spay your dog; this will make them tamer and even-tempered. Indeed, genetics is a major factor that influences a dog’s basic characteristics. But environmental factors could also play a part in making the dog develop new characteristics. You can prevent dog aggressiveness towards people observing simple rules such as early socialization. A mature dog that manifests aggressiveness should be referred to a professional so that proper desensitization can be administered. Aggression in pet dogs can often be a natural response. Often, a dog are going to demonstrate aggression when they are in peril or when they’re hurt of petrified. Some a dog are going to express aggression when they are terrified or when they’re injured. When your have problems with weimaraner aggression or aggression of any other dog breed or mix, it is necessary that you first look for the source of the aggression. It is just when you are able to work out what is causing the aggression in your canines, that you can efficiently cope with it. It is very important that you assess the reason for your dog’s aggression. As mentioned, there could be a wide range of reasons why your dog is displaying aggression. Seldom is it going to be something that is innate in the domesticated dog. If you have a rescue dog, aggression be triggered by how the dog was taken care of by its earlier owner. Ask yourself the question – Is my dog aggressive as they’re attempting to shield themselves? Do what you can to make sure that you evaluate whatever it is that might be causing the aggression in your canines. Check out the way that you’re treating your animal. Are you threatening in your slant? Do you get your canines to go along directions by shouting your instructions? Do you take on a very shrill tone when you give commands. Consider that dogs respond to you better when you consult them in a calm and lighthearted way. It may become needed for you to change things if you don’t do that yet. Dogs may also become aggressive when they are guarding. Guarding refers to the behavior where the weimaraner protects a painful area on their body that they do not long for touched. If this is what is causing your weimaraner aggression, you may really have to get veterinary attention. Speak with your vet about this so that can find a way to cope with it properly. Lastly, your dog’s hormones might be causing their aggression. Have you taken your dog to be spade or neutered? If not, then you need to really consider taking your pet dog to the veterenarian and getting the procedure done. Doing that might help control the hormones that might be causing the aggression in your dogs. When you have an aggressive dog, it can definitely be an extremely aggravating thing. However, please keep in mind that weimaraner aggression continues to be treatable and there remains something you can do. However, if you feel at a loss, you may always solicit a professional. Many dog trainers out there will be able to help you. You could also use a good ebook to help you with aggression in your dog and with any other condition that they may have. If a dog hasn’t been exposed to many different experiences, including loud noises, during his essential socialisation period (3-14 weeks old), when he gets older he might have difficulties coping with noise, frightening sounds like fireworks or loud engine noises. Certain breeds of dogs also seem to be more sensitive to noise than others. Noise problems tend to get worse over time, rather than better, if not addressed. In additon to these videos, download the free factsheet below to see how you can help your faithful firework-fearing friend through Bonfire Nights here: http://www.dogstrust.org.uk/_resource. Congratulations on your brand new puppy. Now what? Do you know what dog supplies you’ll need? If not, here is a quick list of five essentials which will help you out with your new dog. Finding a name which you and your family can all agree upon is sometimes challenging. My advice is to pick a name which is short and clearly understandable to the dog. Never name your dog with anything which can be mistaken for common commands like sit or stay. Try to say the name as much as you can as soon as you can so the new puppy will begin to understand. Don’t change the name after a few days either since this will only confuse the dog. Dogs should be microchipped as soon as possible. Microchips are inserted under the skin and can identify your dog if it ever gets lost. A collar is also an essential item in that it helps you to control your dog. They are often used to place identification tags as well. Don’t forget to replace the dog’s tags since they can rust and become unreadable over time. All animals require food and water. So you’ll need bowls for its food and water. When it comes to picking out dog food, slowly introduce your puppy to new food by offering an undersized amount until the dog is used to it. Also it is very important your dog has water available at all times. The water in its bowl needs to be clean, fresh and changed often. It is important that your puppy has somewhere to sleep before you bring it home. Provide warm, comfy blankets even if it is warm out since it can get cool during the night. Initiate the dog to the area when you get home and make it fun by putting all its toys there. You’ll want to be sure the bed is in a spot which is away from wind, direct sun and rain. Make sure to buy dog toys and plenty of them. Toys prevent boredom and often can prevent your new dog from destroying the rest of your house. Make sure toys are non-toxic by buying them from a reputable pet shop. Try to only give your dog a few toys at a time. It won’t be as excited if there already is a bunch of different toys scattered around the house. These five different essential dog supplies will most certainly help you in providing the best environment for your new puppy. Craiova Association Education Center of Canine from Romania trains dogs for supervising sick children. Beyond training, evaluation and canine contests, some dogs can change the lives of people living together. After training the female Labrador Nechi, aged 7 months returns home to the family Flore, unlike her brothers that are trained to become racecourse dogs, Nechi will be a therapy dogs for a little girl Alice of five years that have severe disabilities. The family Flore decided to take a dog after having participated in an action dedicated to children with disabilities, organized by Canine Education Centre and the World Vision organization. At this meeting, families and children were encouraged to caress the dogs and walk them through the park. Liviu Ionescu said that if children are going to caress, pull ears, and take the leash, then that is perfect because that means that they are exceeding their limits. Alice Mother said that Alice’s reaction was very good and it was not expect at all, the girl started to touch absolutely every dog, she liked it from the start. They can leave the child in safety with the guarantee that the dog is quiet. Child develops personality, desire to know and wish to get social. The dog gives him a feeling of relaxation and tranquility. The little one has with who to play and he is no longer alone in the world. That kind of dogs can be useful for blind persons. Guide dogs may be an important aid to a blind person. They are taught to close and open the door, bring items and to indicate that the master should step down, to follow a group of people when crossing the street and to get the owner at home. But a guide dog involves high costs, requires an extended training and daily walks. A specialist training begins and continues with the owner. The best guides are medium-sized dogs, because blind they may feel slightly moves through a rigid handle. Many people perceive a Doberman’s growling as a sign of aggression. Actually it’s quite the opposite. It’s his way of telling you that he feels trapped and fearful and wants you to back off so he won’t need to become aggressive. You should never punish your Doberman for growling. Punishment may result in stopping the behavior, but it won’t take away your dog’s fear. Without being able to warn you to stay away you may find yourself being bitten as a result. Instead of working to prevent your dog from growling, your goal should be to change the situation that is making him fearful. When your dog feels comfortable, he will have no need to warn you. He will not feel threatened in any way. Knowing what is causing the situation and changing it will help your dog feel more comfortable. If your Doberman has never shown any fear or anxiety at being approached and suddenly starts growling for no apparent reason, he may be in pain and worried that any contact with you will cause the pain to increase. A trip to your vet could help relieve the problem. Once the pain goes away, he will once again be the loving member of your family you are familiar with. Fear of people approaching or new situations can cause a Doberman to growl. This is often the case when you first acquire a new puppy and it’s certainly understandable. Your puppy has just been taken from his mother and siblings and everything familiar. He now finds himself in a new situation with new people, and fear is natural in this case. He may growl to warn you to stay away to protect himself from the unknown. This also happens to older dogs who were not properly socialized when they were young, making them fearful of new people and new situations. Slowly socialize your Doberman by letting him meet a variety of people. Placing him in a variety of situations will give him more confidence and make him less anxious. If your Doberman issues warning growls whenever someone approaches his food dish, bed or a part of the room he has staked claim to, you need to enroll him and yourself in alpha dog training. Asserting yourself as the leader of the pack and establishing his role of low dog in the pack is necessary to the safety of your entire household. A Doberman who believes he is the pack leader poses a threat to everyone in the home. A family member may accidentally challenge his leadership and trigger an attack which could result in a serious injury. Once your Doberman feels safe and confident with new situations and people and knows his place in the pack, the growling will stop. You will have built his trust in you and confidence in his ability to feel safe. Your pet will possibly experience dragon breath occasionally. Naturally, pets do have a tendency to eat bizarre smelling things occasionally. Even some of their ordinary food can smell engaging to say the least. Occasional dragon breath is standard in pets. But if your pet habitually has evil breath and it becomes a repeated problem, it’s likely there are underlying causes that need to be addressed. The official term for bad breath in pets is stinking breath. There are many common causes for appalling breath. Conditions like diabetes mellitus, swelling of the nose and sinuses and stomach issues may result in dog breath. Viral, bacterial or fungal conditions can also lead to bad breath. Sicknesses like tonsillitis may also be a cause. There are some surprising causes like coprophagia, where dogs eat poop, that might naturally lead to dog breath. But the most typical reason for terrible breath in pets is periodontal disease. Periodontal sickness is due to plaque increase on your pet’s teeth especially round the base of the teeth where the teeth and gums meet. If not treated, plaque will not just irritate and inflame the gums, it can disintegrate the fundamental bone that holds teeth in place which could well lead to lose teeth and finally tooth loss. Further, periodontal sickness can make it hard to nibble which may have an effect on your pet’s nutritive balance. When it comes down to spotting periodontal sickness there are a few signs to look out for. If you uncover any of the following your pet might have periodontal illness and you need to contact your vet. If your pet has lingering dog breath, it’s time to visit with your vet to diagnose or disqualify any medical issues which should need speedy attention. Your vet can also give your pet an inclusive oral examination and teeth cleaning. Regular teeth cleaning is endorsed to stop bad breath as well as periodontal illness. Perhaps the best prevention is to develop a method for dental care. Each 6 to twelve months you must schedule a regular vet examination to discern how frequently the teeth should be cleaned. You have to also brush your pet’s teeth all of the time. On a continuing basis, there are several dental toys and treats that may be used to help cut down plaque increase. If your dog is experiencing coprophagia, there are 1 or 2 dietary additions you can use to help. Having a continuing dental care plan and regular vet dental cleaning is the best strategy for perfect dental health and right way to be pro-active against the primary cause of dog breath in your pet.